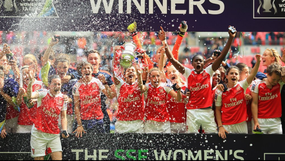 Aimed at both boys and girls, the FA Writing Challenges competition asked students to write speeches, poems and newspaper articles about the SSE Women's FA Cup Final. Each challenge was introduced by inspirational videos of top female players and supported by sets of free teaching resources. The competition is now closed but the resources, including lesson plans and videos, have been re-purposed and are now available to download for free. Each challenge is linked to the national curriculum for Key Stage 3 and supports cross-curricular learning. The challenges help students develop their persuasive and descriptive writing skills and use vocabulary appropriate for different forms of writing.